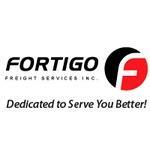 Fortigo Freight Services Inc.is a dedicated transportation provider located in Etobicoke, Ontario. Fortigo Freight Services Inc. was established in 2006, but its freight service in Canada dates back to 1975. A privately held company, Fortigo’s core business is dedicated fleet services. Products Carried: Fortigo Freight Services Inc. is one of Canada’s fastest growing dedicated fleet carriers. As an Etobicoke, Ontario based dedicated transportation provider, core services we provide include: Specialized Equipment/Drivers, Direct to Store, LTL/Truckload, 4PL, Integrated Logistics, Inbound Logistics, Reverse Logistics, Dangerous Goods, Waste, Cross-docking, and Pick/Pack and Subassembly.